Most offices have panelled suspended ceilings lit by either 600x 600 4 x 18w T8, fluorescent, single 55w Philips fluorescent units or 1200 x 600 with 4 x 36w T8 fluorescent fittings. Flat ceilings are often surface mounted versions or either 5’ or 6’ twin T8 or T5 fluorescent units. Generally, the light from these is adequate however as they deplete (often 30% in 6 months) the quality of the light becomes poor and often yellow. When you consider we spend around a third our lives at work, if this is in a poorly lit office then the effects on your eyesight can contribute to their deterioration. Using the latest in LED technology, LEDlights4you can reduce energy costs in your offices by up to 75%. We offer a free site survey where we will assess your current lighting systems and then produce an energy saving report, to identify where energy savings can be made. Call us today for advice or to book your free lighting survey on 03333 446084. Energy saving is also another big benefit, for example 600 x 600 quad fluorescent units consume around 84W total taking into account the chokes, whereas the latest LED 600 x 600 panels are actually 20% brighter and consume just 25W, and energy saving of 71%. For example Nortech Control Ltd based in Cwmbran South Wales, were able to save over £9,440 over 5 years, with the payback in just 32 months. Replacing lighting with LED panels and battens will improve the quality of light in your office. 4000 – 5000 Kelvin is the colour measurement of natural daylight. Our LED solutions for offices have a Kelvin measurement of 5000. Unlike fluorescents good quality led lighting will keep its colour without yellowing or depleting. Quality LED panels are flicker free and depletion is just 10% over 10 years. We start by carrying out a free site survey to highlight issues with your current lighting and determine what type of LED lighting would benefit your business the most within agreed budgets. Most importantly we will be able to determine what energy and monetary savings you will make. Installation is then carried out by our team of expert LED lighting installers. All our installers are highly trained and work to IEEE Standards. We recognise that installation can be disruptive and so we offer a flexible service that works for you. We will ensure minimum downtime for your business and can, if required, carry out our work over lunch breaks or out of hours. Additionally, we can erect portable barriers if required to close off areas from employees. Read more about our LED installation process. Why is it important for an LED Light to be ETL (Energy Technology List) compliant? Firstly, these lights are eligible for ECA (Enhanced Capital Allowance) and you’re assured that the light will be efficient. We say “Better Lights make Bigger Savings” because the initial cost of a light is just part of the overall picture – its running cost and durability are much more important. For our customers this means we can make energy savings of 75% on conventional lighting. With Payback in just two years. LEDlights4you installed 600 x 600 40w Epistar LED panels in 4000 kelvin colour. This transformed the office into a fresh clean, daylight bright environment, ideal to lift spirits and focus minds. This made a 60% reduction in energy use with a payback of just 24 months. Ledlights4you replaced all 116 panels with just 94 x 600×600 40W LED 100Lm/w panels and fitted sensors in corridors and toilets to save energy. Solution was to reduce the number of lights from 41 down to 33 and reposition in the Isles. Average LUX levels were improved to 250LUX average and energy usage reduced by 64%. LEDlights4you LED Tubes 26W 130lm/w, in 4000 Kelvin, Daylight, ideal for colour matching without tinting as with fluorescent. TUV Certified Minimum Build Standard 50,000 hours, 60% energy saving. LUX levels were increased to 250LUX average and 60% energy saving. LED Brand: EPISTAR-SONY Approved LEDs. 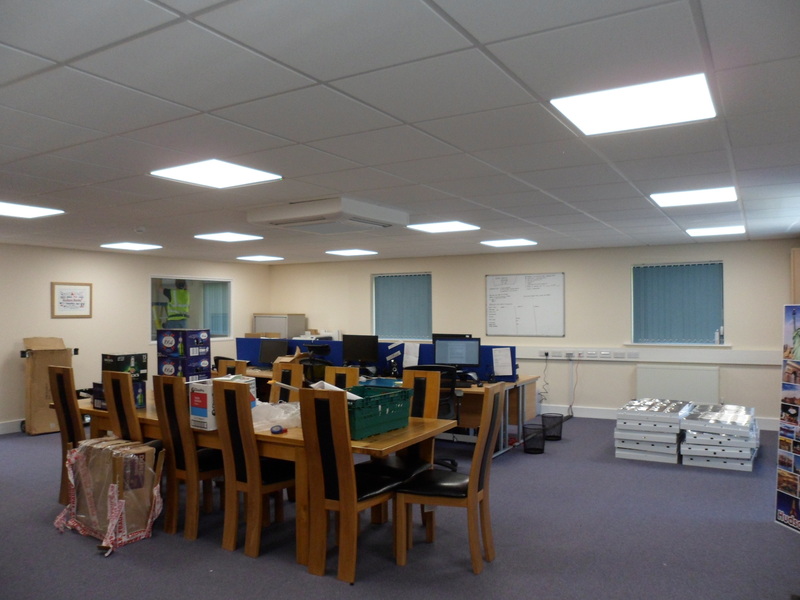 If you are looking to save money and improve the quality of your office lighting, we can help. For more information on how much you can save, or to book in for your free initial survey, call us today on 03333 446084 or fill out a contact form and we’ll get back to you.